When I first joined Toastmasters International, I was in awe of those Toastmasters who visited our fledgling club to assist us with learning what to do and how to do it and, right from that first meeting back in February 2011, I set my sights on attaining the highest level of educational recognition Toastmasters International bestows upon a member – the Distinguished Toastmaster (DTM) award. But a DTM doesn’t come easy. It takes hard work and dedication, as well as service and commitment and, more often than not, the journey is a marathon, not a sprint, and can take years to accomplish. For me, it took 7½years. I had accomplished every item on that list in by the end of June in 2015 with the exception of one – serving as a club sponsor, mentor or coach. That was (and is) the hardest task to accomplish and can take a whole year to complete. For me, it became very difficult indeed as Dean and I commenced our travels around Australia. So I locked it away in the recesses of my mind and resigned myself to waiting for the right moment. When we finish travelling, we had to build a house, move into that house and make it a home, and then I set out to become more involved in Toastmasters once again. I dedicate time to getting to know the members and clubs in this new town where we now live, and I went about establishing (and working) on new network connections. But I was ever aware in the back of my mind, that I had one task to complete to attain that DTM I coveted so much. Then I met Tracey, another Toastmaster who also had only one goal left, the same goal, so together we set out to create a new club. And so we did! Last Saturday night we celebrated that club being officially recognised (chartered) by Toastmasters International. It was a lovely celebration and the culmination of all the hard work and dedication we put into forming that new club. Doing so isn’t an easy task. 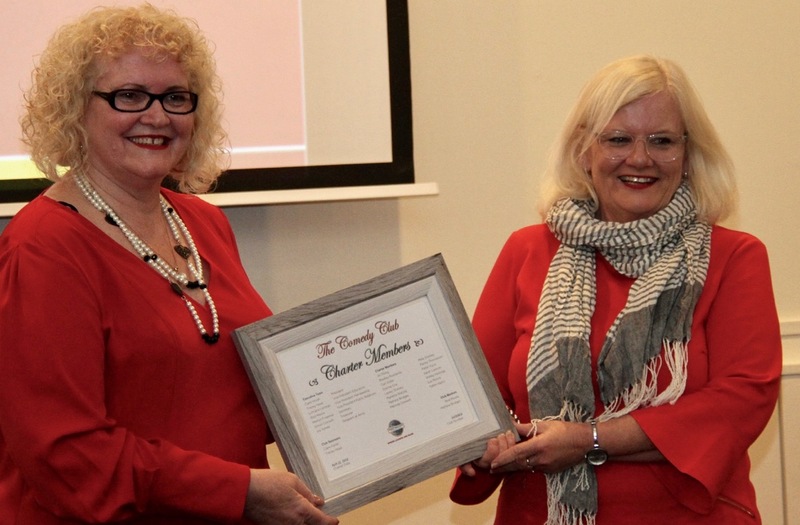 It takes dedication, determination and diligence, and for both Tracey and me, doing so together has also meant forming a friendship forever highlighted by becoming Distinguished Toastmasters. 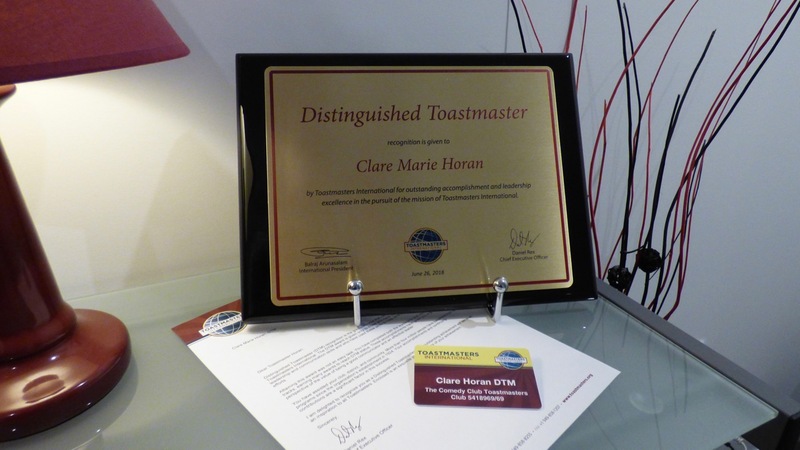 I joined Toastmasters International as a charter member of a corporate club back in March 2011. The company I was working for started the club (hence the term ‘corporate club’) and I was one of the twenty staff members who joined making up the required number of members for the club to reach charter strength and become officially recognised as a club by Toastmasters International. I’ve also been a member of several community clubs and have served every club I have been a member of, gaining valuable leadership experience in every executive role as well as being the Newsletter Editor for two of those clubs. I headed up a team of other Toastmasters when I was the convenor for my District’s Semi-Annual Conference in 2013 and I also served our district as the Public Relations Officer for the 2014 -2015 term. This summarises the leadership roles and tasks I’ve undertaken since joining, and I embrace this, however, it is within the communication track where my true Toastmasters’ passion lies and shines. I love writing and delivering speeches and along the way, I have also discovered I love competing. By the time you reach and achieve the Advanced Communicator Gold award, you will have written and delivered 40 speeches. I have loved every one of them, but I have also taken many of those speeches through various iterations as contest speeches. The first contest I entered I won and went onto represent my Division on the District stage and was placed third. I was thrilled, however . . . Earlier this year, I wrote about my Time to Shine when I won the Humorous Speech Contest at the Division level this year, as well as my Main Distractor when I went on the win on the District stage. What a buzz! Competing against the representatives from every other Division in our District and walking away with the trophy and title District 69, 2018 Humorous Champion. I said at the time that I was honoured to have represented my Club, my Area, and my Division at the highest level in the Humorous Speech Contest and I still am, I am still full of pride at being the owner of the prestigious title of District Champion. This truly was the culmination of a lot of hard work writing my speech, listening to feedback, paying attention to my mentors and implementing tweaks and changes to ensure my speech was a cut above. Who would have thought Fuel Production (aka Making Spaghetti) could/would be so funny? I think I feel a little sad for my big win now because it has been overshadowed (ever so slightly) by receiving my DTM award and my first name badge with those initials proudly displayed after my name. Then yesterday, my plaque arrived. I feel so chuffed with myself and simply had to share this with everyone. I’m not sure where my Toastmaster journey will take me now. Perhaps to new and exciting heights. BTW. Tracey calls me her doppelgänger. 💜😁💜 thanx Kim. I still miss that club.